Snow fell so heavily on the morning of January 21 that the priest feared he might not make it to the remote country church in time. So secretive were arrangements for the funeral, even he had not been told about its location until a few hours before; a small chapel in southwest Iceland, where a grave had been dug overnight without the knowledge, or permission, of its minister. But as Jakob Rolland struggled along the road to that tiny cemetery, he rehearsed the address he would give to the five people waiting beside the coffin, brought there under cover of darkness. He would compare the genius of the man he was burying to that of Mozart and Jesus Christ. 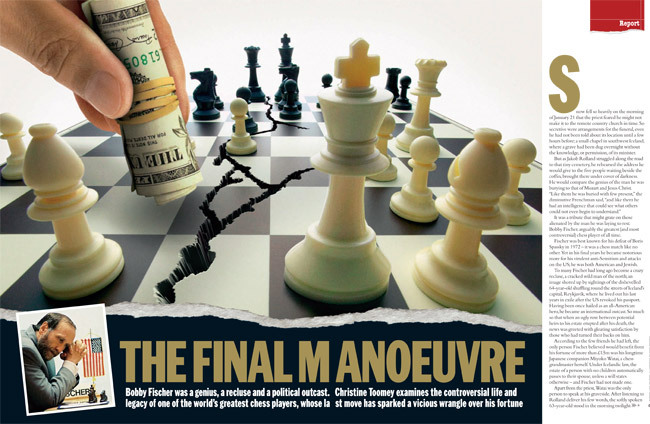 It was a tribute that might grate on those alienated by the man he was laying to rest: Bobby Fischer, arguably the greatest (and most controversial) chess player of all time. Fischer was best known for his defeat of Boris Spassky in 1972 – it was a chess match like no other. Yet in his final years he became notorious more for his virulent anti-Semitism and attacks on the US; he was both American and Jewish. To many Fischer had long ago become a crazy recluse, a cracked wild man of the north; an image shored up by sightings of the dishevelled 64-year-old shuffling round the streets of Iceland’s capital, Reykjavik, where he lived out his last years in exile after the US revoked his passport. Having been once hailed as an all-American hero, he became an international outcast. So much so that when an ugly row between potential heirs to his estate erupted after his death, the news was greeted with gloating satisfaction by those who had turned their backs on him. According to the few friends he had left, the only person Fischer believed would benefit from his fortune of more than £1.5m was his longtime Japanese companion Miyoko Watai, a chess grandmaster herself. Under Icelandic law, the estate of a person with no children automatically passes to their spouse, unless a will states otherwise – and Fischer had not made one. Apart from the priest, Watai was the only person to speak at his graveside. After listening to Rolland deliver his few words, the softly spoken 63-year-old stood in the morning twilight whispering the Buddhist prayer for the dead, before trudging away through the snow in the company of the man who had cared for Fischer to the end, his friend Gardar Sverrisson, who was there with his wife and grown-up children. It was Sverrisson who made the arrangements for Fischer’s funeral. The church at Laugardaelir, near the southern town of Selfoss, was originally built on farmland belonging to his wife’s family. For that reason he seems to have felt no need to inform its minister in advance that a grave was to be dug there. While Watai flew back and forth every few months from Tokyo, where she edits a chess magazine, to be by Fischer’s side, Sverrisson was his constant companion. He was one of the few who knew Watai and Fischer had married. He also knew that as soon as his friend died, there would be a fight for his fortune. Within hours of Fischer’s death from kidney disease, on January 17, Sverrisson received a call from the chess champion’s ex-brother-in-law, Russell Targ, the former husband of Fischer’s late sister, Joan, whom Fischer never forgave for leaving her. Targ was not calling to commiserate, but to make it clear he would be flying to Reykjavik to secure the interests of his two sons, Fischer’s nephews. Unsurprisingly, the clandestine burial caused an outcry. Not only was Targ furious at missing it; so too were many of Sverrisson’s countrymen. Despite the controversy that surrounded Fischer in his later years, it was acknowledged by many that he had put Reykjavik on the map. So electrifying was the 1972 championship that 40 films and TV documentaries and 150 books – including the bestseller Bobby Fischer Goes to War and the upcoming film of the same name – have been made about it. In recognition of this, some had wanted Fischer buried in a historic cemetery in the capital. There his grave would have become a tourist attraction – something Fischer would have loathed. Little surprise, then, that Rolland describes the discreet funeral as the chess champion’s “final checkmate”. “Bobby Fischer played his last move very well,” he says. “He finally got what he wanted, peace and quiet.” But now it seems the funeral might not be allowed to be his final move. There is talk of Fischer’s body being exhumed. In addition to the claim on Fischer’s estate by Watai and Targ, a third party has now stepped forward demanding a cut of his fortune. She is the mother of a seven-year-old Filipina girl, Jinky, who she says is Fischer’s daughter. In the Machiavellian world of international chess, some believe Jinky’s mother, Marilyn Young, a 29-year-old management-studies student, is being encouraged to pursue her claim by those whom Fischer ostracised. But Young’s lawyer, the Filipino chess grandmaster Samuel Estimo, says she is so confident of her claim she will pursue it to the point of requesting a DNA test be carried out on her daughter and Fischer’s corpse. Those few people who have remained loyal to Fischer are horrified at this prospect. In stark contrast to the perception of him as a deranged, often greedy and bigoted recluse, the picture they paint is of a far more complex character deserving of greater understanding than he ever received. As Fischer’s health failed during his final years, and he fell out one by one with those he once counted as friends, he sought the company of just three men – Sverrisson, the Icelandic chess grandmaster Fridrik Olafsson and Magnus Skulason. Skulason, also a chess player, is more significantly a psychiatrist, who spent hours by Fischer’s bedside talking about a wide range of subjects, including the grandmaster’s past. It is easy to see why Fischer, prone to paranoia, trusted Skulason. He is a kind and sensitive man. Underneath a pile of documents he gives me about Fischer, I find pages of poetry photocopied “to help me rest” after our long interview. But the psychiatrist is also used to plumbing the depths of the most tortured psyches. He is head of Iceland’s hospital for the criminally insane. His insights into what drove Fischer are telling. Some have speculated that if Fischer had been born today he might be diagnosed as suffering from Asperger’s syndrome, because of his difficulty in socialising, his tendency to sudden outbursts, and also his phenomenal recall; he could repeat lengthy conversations in Icelandic without understanding the language. Skulason does not agree with this, but stresses that he did find it hard to form emotional bonds with others. When they talked, he says, Fischer often showed interest in the meaning of dreams. “He told me he kept having the same dream. But he never wanted to talk about it. It seemed memories were trying to come out,” says the psychiatrist. Born Robert James Fischer in Chicago on March 9, 1943, he never knew the man listed on his birth certificate as his father: a German biophysicist and communist named Hans-Gerhardt Fischer, who divorced his mother, Regina, when he was two. But declassified FBI documents suggest Fischer’s real father was Dr Paul Nemenyi, a Hungarian-born physicist with whom Regina began an affair in 1942 and who paid for some of Fischer’s schooling. The FBI had kept Regina, of Polish-Jewish origin, under surveillance for decades as a result of her own communist sympathies. Apart from this help from Nemenyi, however, Regina raised her son and his sister, Joan, alone. They struggled financially. After moving briefly to LA and Phoenix, they settled in Brooklyn in 1948. When Fischer was six, his sister, then 11, bought him a plastic chess set and together they learnt to play. By 13 Fischer was US junior champion, by 14 US champion, a title he would win eight times, and by 15 the world’s youngest grandmaster. With an IQ said to be higher than Einstein’s, he was hailed as remarkable talent. But even at this age, it was clear that his extraordinary ability was matched by an unpredictable and increasingly demanding personality. At 16 he dropped out of school. Then he asked his mother and sister to move out of their Brooklyn apartment so that he could live alone. Visitors noticed he slept in all three beds in the flat in rotation, keeping a different chessboard with a game in play beside each. Though Regina encouraged her son’s chess career, it was only one of many causes she championed. A committed pacifist, she once spent months walking across Europe in an anti-war demonstration. Fridrik Olafsson, who first met 15-year-old Fischer at an international chess championship in Slovenia, tells an unsettling story about how, at breakfast one morning, Fischer took his knife and started slicing up wasps crawling across the table, saying: “That’s how I’m going to squeeze my opponents.” In the years that followed, Fischer did not just defeat opponents; he crushed them. By the time of the 1972 world championship, he was described as “the most individualistic, intransigent, uncommunicative, uncooperative, solitary… champion in the world”. But also “the strongest player who ever lived”. He had also gained a reputation for being money-grabbing. As well as moaning about his chair, the lighting and the whirring noise of TV cameras in Reykjavik, Fischer complained that the prize money of $125,000 was not enough. Spassky had taken home just $1,400 when he won the world title three years before. But Fischer would not agree to play in Iceland until the British financier and chess fan Jim Slater, of Slater Walker Securities, upped the winning pot to $250,000. Skulason and others believe it was not the money that was important to him, rather that the size of the prize made Fischer feel valued. After winning the 1972 championship, he would turn down far larger sums offered to tempt him out of seclusion to defend his title; the Shah of Iran once offered him $2m, Ferdinand Marcos of the Philippines $3m and a millionaire in Spain $4m if the matches were played in their countries. But it seemed his fear of losing was too great. When Fischer returned to New York from Reykjavik, he was given a hero’s welcome and handed the keys to the city. After that he shunned the limelight, moving to California for a while and leaving $5m-worth of unsigned endorsement contracts on his lawyer’s desk. The international chess community tracked his subsequent decline like the path of a dying comet. After refusing to defend his world title in a dispute over match rules, he lost it by default in 1975 to Anatoly Karpov. It was then only a matter of time before his anger overwhelmed his brilliance. In California he became involved with an oddball fundamentalist cult, was arrested on suspicion of armed robbery – a result of mistaken identity – and subsequently became lost in his own world, dressing like a hobo and drifting from one seedy hotel to another. The next, and last, time he would step onto the world stage to dazzle enthusiasts with flashes of his old talent was at a controversial rematch against Spassky in Belgrade in 1992. Ignoring threats of 10 years’ imprisonment and a hefty fine from the US government because of a UN trade embargo against the former Yugoslavia, he beat Spassky again and received $3.5m. But a warrant for his arrest was also issued by the US. He would remain a wanted man in his country of birth until the day he died; a source of anguish, says Skulason, and the likely reason for his Uncle Sam-bashing. Fischer had gone to Belgrade because he needed the money. It is what remains of it that now constitutes his disputed estate. For more than a decade following this last match in Belgrade, Fischer roamed restlessly around central Europe and the Far East. He spent much of his time in Budapest and visiting Watai in Japan. But he also lived for a while in the Philippines. Periodically, journalists seeking interviews would smoke him out and he would agree – if the interviews were broadcast live. He would then use the airtime to launch vicious diatribes against the US, Israel and the Jews. It was his outburst following the 9/11 attacks in New York that finally tipped the balance. The full vitriol Fischer unleashed is unprintable. But the bottom line was that he described the attacks as “wonderful news”. Three years later, as he was about to board a plane in Tokyo, he was arrested on charges of travelling on a revoked US passport and tax evasion. He spent the next eight months in jail in Japan while the Americans sought his extradition. It was during this time in prison that Fischer obtained a special licence to marry Watai. Few appear to have known about the nuptials, one of the reasons for the ensuing row over his fortune. Desperate at the prospect of being extradited, Fischer began calling old friends in Iceland for help. A committee of chess enthusiasts, the RJF committee, including Skulason, Sverrisson, Olafsson and Fischer’s former bodyguard and driver, Saemi Palsson, was formed to petition Iceland’s government to grant him exile. Despite fierce opposition from the US, the parliament voted unanimously to grant him full citizenship. In March 2005, a scruffy-looking Fischer stepped off a plane in Iceland to the full glare of the media. But for the next 2½ years he virtually disappeared off the radar. Occasionally he would be spotted sloping along the streets of the capital in his baseball cap, eating in a hamburger joint called American Style and sitting reading in a bookshop called Bokin. But the public left him alone. Far from being the lost shadow of a man he was often portrayed as, friends say he enjoyed being treated as an ordinary citizen. “Becoming so famous at such a young age had placed a tremendous burden on him. So many people had tried to make money out of him. He was glad to be rid of that,” says Skulason. Even in Iceland, anyone who vaunted their friendship with him and tried to profit from it, like his old bodyguard, Palsson, were banished from his inner circle. In the end it was Sverrisson and his family that Fischer spent most time with. Tall and softly spoken, Sverrisson was once head of Iceland’s association for the disabled and understands life’s hardships. So does his wife, a nurse. The couple often took Fischer on long walks around Laugardaelir, the reason its churchyard was chosen for his burial. In the final months of his life, Fischer bought a flat three floors above Sverrisson’s on the outskirts of Reykjavik, and the 48-year-old would often alternate with his wife sleeping there so that Fischer was not alone. From time to time Watai would come to stay. But with work in Tokyo, she never moved there. How she would have felt about the visit Fischer received in September 2005 from Marilyn Young and her daughter, Jinky, is uncertain, though she was in Iceland at the time. Young was certainly unhappy. A stone’s throw from the Bokin bookshop where Fischer spent so much time is a shop selling oriental food. Young would go there to buy items she missed from home. The owner’s sister is the Philippine honorary consul, Priscilla Zanoria, whom Young contacted after arriving because she was homesick. “She was lonely and asked if she could stay with me for a few days,” says Zanoria. How Fischer came to know Young is unclear. Some say they met at a country club in Baguio City, the summer capital of the Philippines. Others that Fischer was a friend of Young’s parents and it was for their sake that he offered to support her baby financially when she fell pregnant after a relationship with someone else. Friends say Fischer loved children. “No-one talks about it, but Bobby often gave money to poor people when they needed it. I’m almost certain he was just a friend to this woman’s family,” says Skulason. Much of this is news to Watai’s urbane Icelandic lawyer, Arni Vilhjalmsson, who produces a copy of a marriage certificate showing Fischer and Watai were married in Tokyo on September 6, 2004. “This is published by the Japanese authorities and confirms they were married,” says Vilhjalmsson, who was also Fischer’s lawyer. Vilhjalmsson was trying to help the chess master resolve a dispute with the Swiss bank UBS, which had, without asking Fischer, transferred 3m Swiss francs (nearly £1.5m) he had deposited with it to an Icelandic bank after he was granted citizenship there. Fischer was convinced the move was part of a Jewish conspiracy against him and insisted the money be transferred back to Switzerland. This dispute was still going on when he died, one of the reasons the exact location and worth of all his assets is unclear. In addition to the claims by Watai and Jinky, there are two other parties circling; the US government, seeking to recoup unpaid taxes, and Fischer’s nephews, Russell Targ’s two sons – on the basis that his marriage might not have been legal. According to Targ’s lawyer, Gudjon Olafur Jonsson, Icelandic law states that surviving relatives – Fischer’s mother and sister died – can make a claim on a person’s estate if that person dies intestate and is neither married nor has children. If the person is married with no children, the spouse inherits the entire estate; if married with children, the spouse inherits one third, the child or children two-thirds. All parties now have until May 17 to file their claims with Iceland’s justice ministry, which could then rule that it is a matter for a district court to decide, or, ultimately, the supreme court. Despite interpretations of Fischer’s secretive burial as the last convoluted twist in a life as complex as the manoeuvres he once executed on the chessboard, his friends say he would be deeply upset at the legal wrangles taking place. They believe he had little idea he was so close to death, which might have been the reason he made no will. Even though he refused to be put on a dialysis machine for the treatment of a kidney disease and spent the last months of his life in and out of hospital. Shortly before he died he had been released from Reykjavik’s central clinic to recuperate at home. It was here that Skulason saw him for the last time. The kindly psychiatrist would offer him grapes and goat’s milk, neither of which Fischer could keep down. “I had the feeling he wanted to talk more about himself,” says Skulason. But he did not then, nor ever again. The next morning Sverrisson rushed him to hospital, where he died.